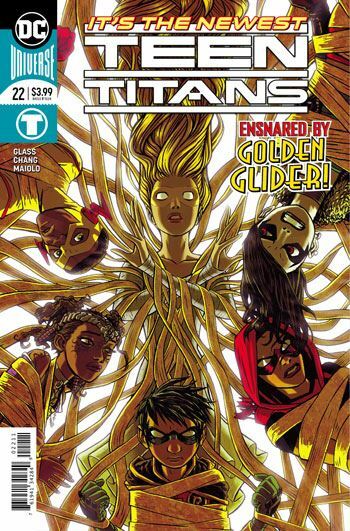 Golden Glider dominates the cover for Teen Titans 22, although she has only a small role in the story itself. That was a disappointment for me. But I think it’s about the only thing that let me down when it came to this issue. Last issue I questioned the way Damien was when it came to possessing the ring that controls Djinn, and in this one we learn that he promptly gave it back to her when it was no longer needed. At first this annoyed me, for the same reasons I had in the last issue, that Damien was acting too darn nice. But here the seeds of a romance are planted between the characters, which makes a lot more sense out of the situation. And his harshness is on view in Robin’s scene with the captive Black Mask. As for the rest of the crew, Crush seems to be sticking in the muscle-and-laughs category. I’m still fine with that. She will get her day eventually, I am sure, and right now the character is basically doing much the same thing Lobo does in any team he gets stuck in. 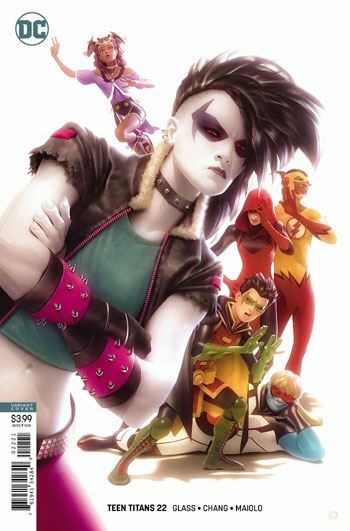 Kid Flash is being built as the counterweight to Robin on the team, and already is finding his teammates a little harder to deal with than he expected. The book seems to be developing Wally’s character well, and I like seeing some strength of personality in him. The conclusion of this issue certainly sets him up for the next story. It’s really only Emiko, Red Arrow, who is failing to grab my interest right now. She is sullen and serious. And that’s about it. The plot of this issue kind of weaves around a bit. That’s the real reason that Golden Glider doesn’t get the play the cover implies she will, because there are too many other plot points to touch on. The story really only gets a focus in the last couple of pages, but that does bode well for the next issue.